Chapter 1: Hybrid Pictures - Kristin Baker, Lisa Beck, Alex Brown, Jules de Balincourt, Tomory Dodge, Jacob Feige, Chris Finley, Wayne Gonzalez, Alex Hay, Carrie Moyer, Elizabeth Neel, David Ratcliff, Wilhelm Sasnal, Chris Vassell (can't find anything). Chapter 2: Rhythm and Opticality - Karin Davie, Philippe Decrauzat, Xylor Jane, David Malek, Anja Schwoerer, James Siena, Esther Stocker, Philip Taaffe, John Tremblay, Dan Walsh, Chuck Webster. 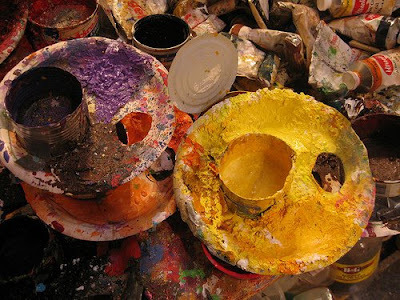 Chapter 3: Colour and Structure - Mike Cloud, Joanne Greenbaum, Mary Heilmann, Daniel Hesidence, Alison Miller, Odili Donald Odita (liked his room in Surface Charge), Ann Pibal, Bernd Ribbeck, Ruth Root, Alan Uglow, Stanley Whitney (now at Team), Jens Wolf. 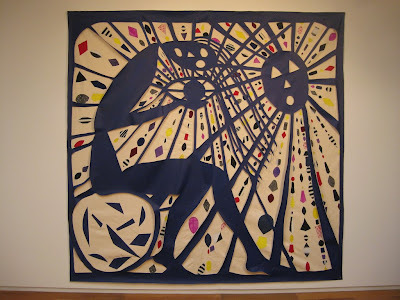 Chapter 4: Found/Eccentric Abstraction - John Armleder, Richard Aldrich, Monika Baer, Agnieszka Brzezanska, Francis Baudevin, Daan Van Golden, Chris Johanson, Tony Just, Marta Marce, Monique Prieto, Alex Ross, Amy Sillman. Chapter 5: Form, Space and Scale - Tomma Abts, Varda Caivano, Kim Fisher, Katharina Grosse, Bill Komoski, Alex Kwartler, Chris Martin, Julie Mehretu, Katy Moran, Olivier Mosset, Steven Parrino, Peter Peri, Thomas Scheibitz, Clare Woods. Chapter 6: The Act of Painting - Bernard Frize, Wade Guyton, Jacqueline Humphries, Nathan Hylden, Charline von Heyl, Jutta Koether, Michael Krebber, Anselm Reyle, Josh Smith, Rudolf Stingel, Kelley Walker, Christopher Wool, Heimo Zobernig. 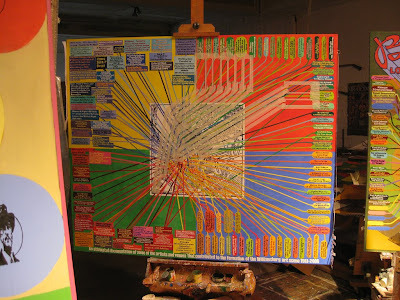 Many artists from Acme, Feature, Friedrich Petzel, Paula Cooper, Team. Jane Benson, at Thierry Goldberg. Saw this show last month, shortly before it closed. NYTimes review (scroll to bottom). RELATED: Clyde Du Vernet Hunt. 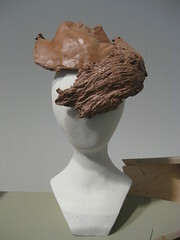 - Ellie Pyle at Eastern District, through Sunday August 23rd. 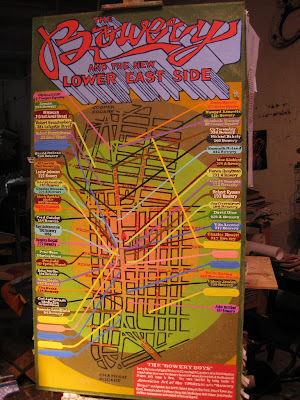 Eastern District is at the Morgan stop of the L train, same block as Ad Hoc Art and the Archive coffee shop. 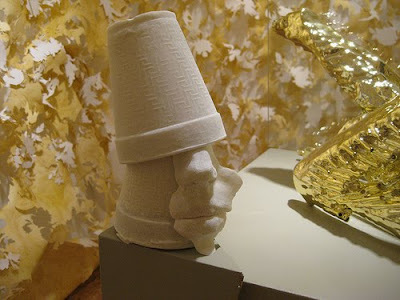 - Bryan Zanisnik is included in a show at PPOW, through August 28th. - Max Carlos Martinez for ONE-NIGHT ONLY!!! at Schroeder Romero... THIS THURSDAY AUGUST 20th, 6-10pm. 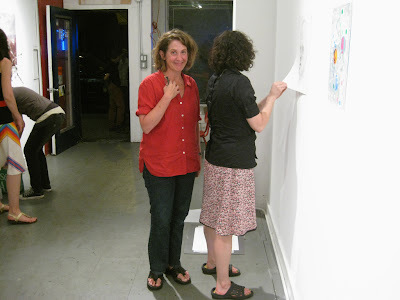 - Joanne Greenbaum upcoming at D'Amelio Terras. 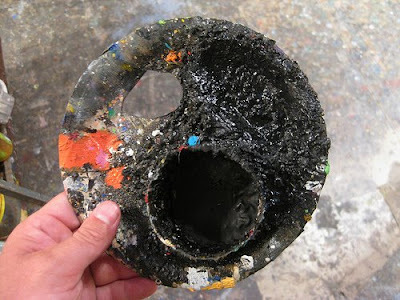 She must be one of the artists in the Painting Abstraction book, right? MUST BE. can't wait for that book. 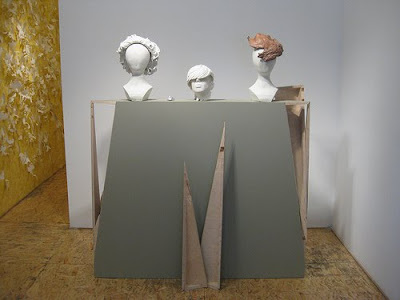 - Elliott Green is opening the front room at D'Amelio Terras.... that is also good; two reasons to go. i don't know yet what else good is opening in september. any recommendations? Speaking of books, Nick Kuszyk has published a children's book... called R Robot Saves Lunch. ORdeR NOw! ps - due to the popularity of this blog with robot chinese spammers, i have to moderate comments for a while... could not keep up with the deletion.... they are posting chinese spam on every single old post. 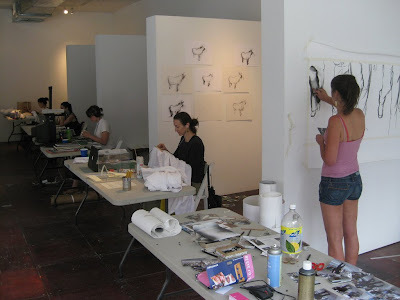 Artcamp Studio Residency Program, at NY Studio Gallery. 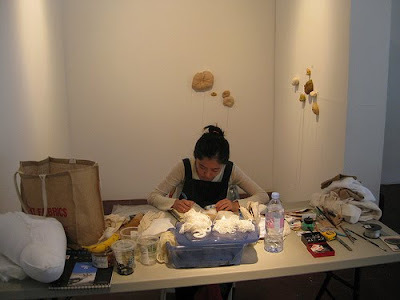 Artists working for two months in a storefront LES studio space open to the public.... you can go in and see what they are doing. Angela Rose Voulgarelis Illgen (left) and Patsy McArthur (right). Patsy is from Glasgow and currently lives in Barcelona. Sung Min Lee from Korea, currently studying in Rochester. 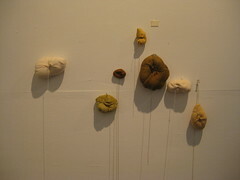 soft sculptures of belly buttons. Sketching a photograph of somebody's belly-button. She's a freak! 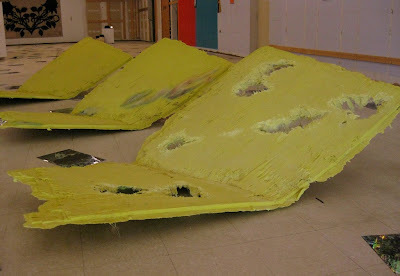 Painting in progress... note the tape. 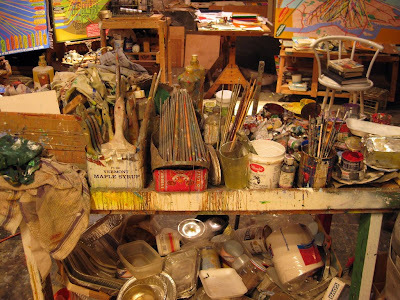 Loren Munk's studio. 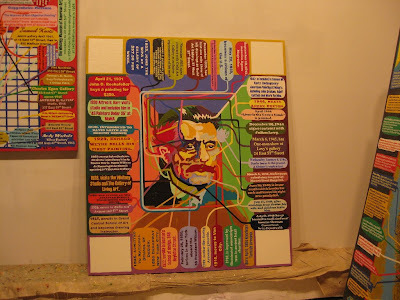 Painter, Documentarian, Archivist, Fan, Historian, Critic, Star, Enthusiast, Journalist, Contributor, Chronicler, a.k.a. 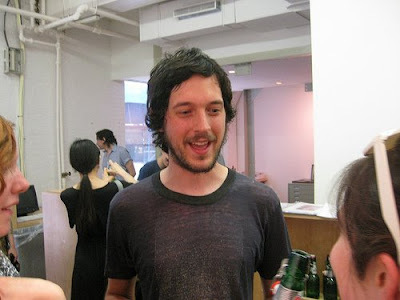 James Kalm. 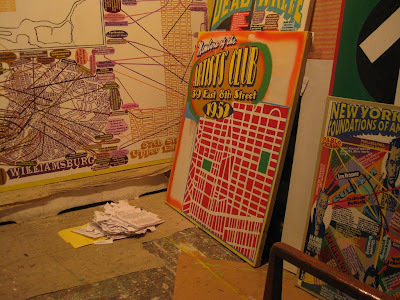 A glimpse (at left) of a huge, exhaustively researched two-canvas work, which is being painted on the last two pieces of the best artist's linen in the world. 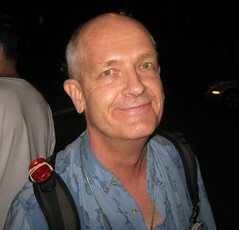 Loren worked at Utrecht for many years. 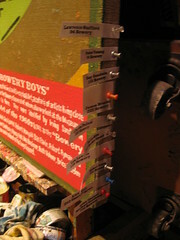 Notes topped by sheet of artist's studio addresses, color-coded by neighborhood. 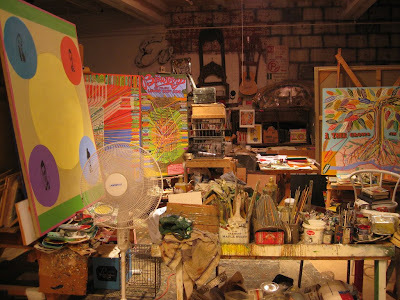 Tom Sanford's Studio, and here. 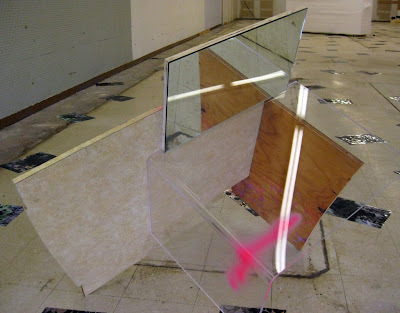 Sarah Braman, Indian Summer Home, 2008 - almost invisible with plexi, doubled by mirror. To the left of the rising sun, at Small A Projects summer UPSTATE NY show, in Greenwich, Washington County. This was a shocker for me. I live here. This is a small town of 5,000, about an hour north of Albany. I work on a farm. NEVER expected to see a Sarah Braman here. Sarah Braman, Indian Summer Home, 2008 - this is the other side... a floating (leaping) facade, flat and joyful... no hint of the boxiness, complexity and depth created by the mirror, plexi, and reflections. 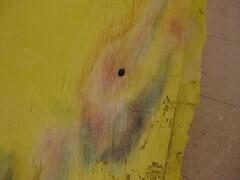 Corinn Hewitt, detail of Strong Hold. 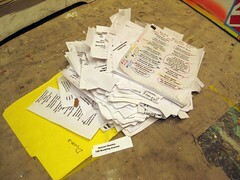 Liked his work in a 7/05 D'Amelio Terras show - My favorites here were the two collages by Corin Hewitt. Really weird. 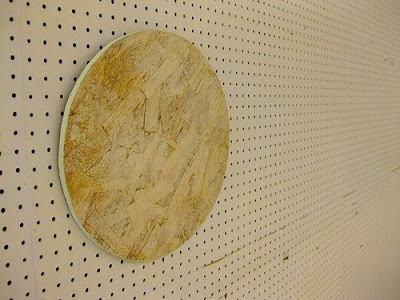 Bill Jenkins, Thicket, 2006 - rimmed with pale minty green, looks like it is speeding through hyperspace on the pegboard. 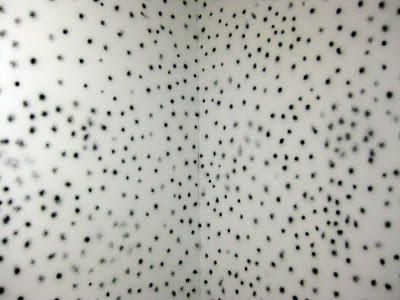 Bill Jenkins, No Title, 2009 - spraypaint on corner wall. 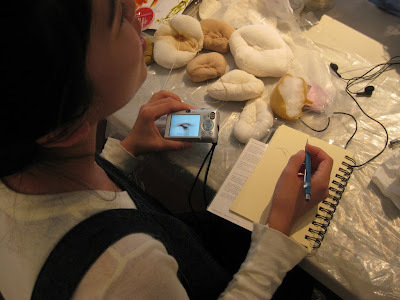 Small A Projects' Laurel Gitlen. To the left of the rising sun is open Thursday-Saturday noon-six, through August 16th. 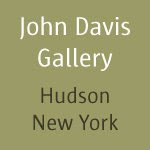 THERE WILL BE A CLOSING RECEPTION August 16th. 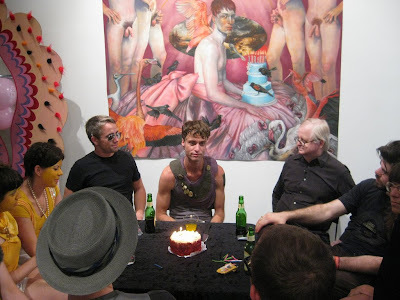 William Powhida, Barnaby Whitfield, Douglas Kelly at Stux... sitting below a gorgeous pastel by Barnaby. 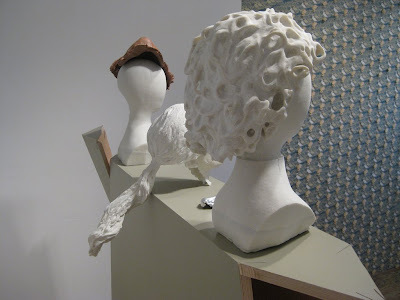 Martha Friedman, at John Connelly Presents. 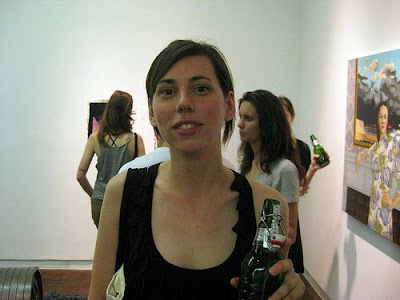 She had that great show at Wallspace. 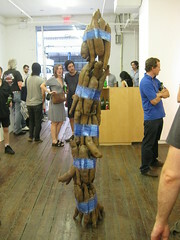 Martha Friedman's piece in the current John Connelly show... weird tower of taped together yams or something... stealthy. 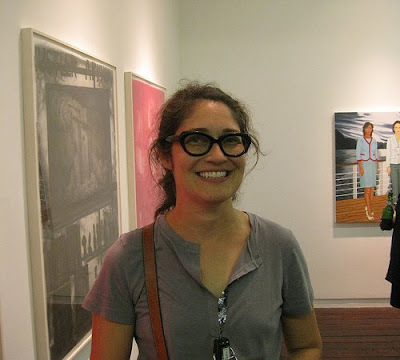 Holly Coulis, at John Connelly Presents... with her painting in the background, and Gerald Davis drawings at left. More Gerald Davis later. Justin Samson, at John Connelly Presents. Enjoyed his show here early this year.... Inside the Cosmic Motion Projector (scroll down a little for photos). 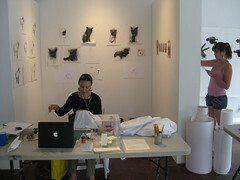 Sharon Butler and Austin Thomas, at Pocket Utopia. 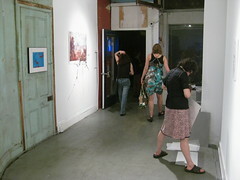 My 246 Editions print at Pocket Utopia, at left. 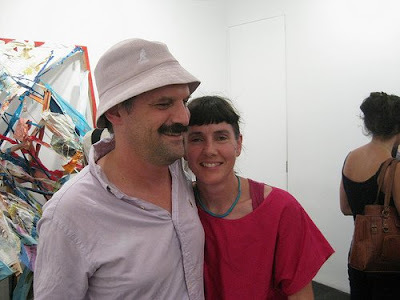 Phil Grauer and Sarah Braman, at Horton, with Lauren Luloff's piece in background. Janet Kurnatowski and Phong Bui, at Janet Kurnatowski Gallery. 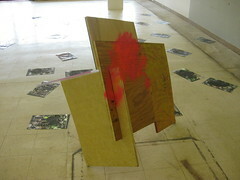 Loren Munk, at Janet Kurnatowski. 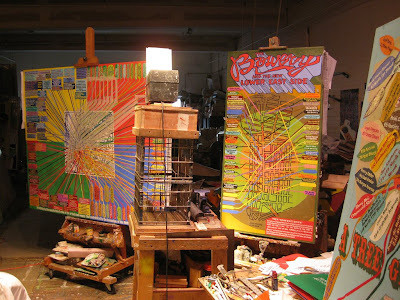 Visited his studio and took some excellent photos... hope to post them this week. 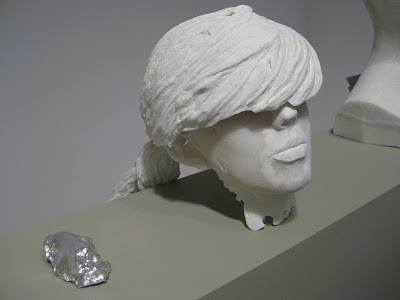 Anya Kielar, in The Ankle Bones Are Higher on the Inside, at Museum 52... with Benjamin Degen, Julia Goldman, Dana Schutz. 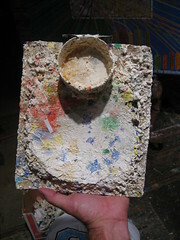 Reviewed by Roberta Smith in Friday's NYTimes. Anya Kielar at Casey Kaplan, on anaba 2/2/09. 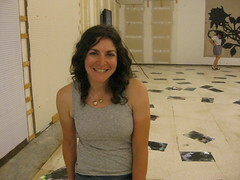 Anya Kielar in Without Walls, at Museum 52, on anaba 12/22/08. Anya Kielar at Daniel Reich, on anaba 4/6/07. 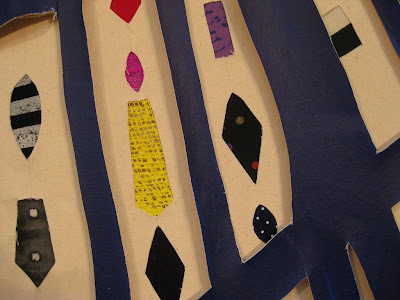 A web of cut and collaged blue-painted canvas, loosely draped over a large plain canvas inset with rays of painted fabric shards.